Now that you have recruited guests and planned every detail of an awesome webinar, it’s time to get the word out. After all, people need to show up and experience all that your guests have to share. But just scheduling a webinar is not enough. And organic reach is at an all-time low for any type of advertising. What you need is a number of ways you can promote your webinar where audiences will see, hear, or read about it and agree to attend. But how and when do you promote it? 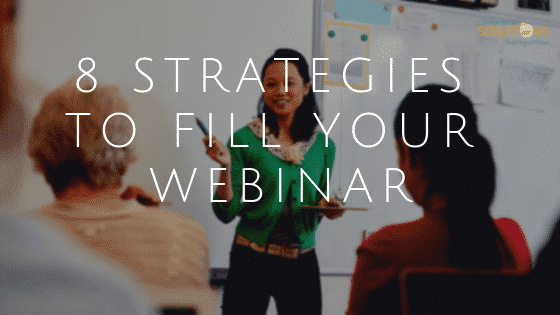 Here are eight strategies you can adopt right away to spread the word about your upcoming webinar. Some of them you may use already for other purposes, so it will just take some adjustments to use them for webinar promotion. Any promotion you advertise online should have its own landing page. Landing pages are specifically designed to provide essential information and guide the user to take specific actions. They are free from unnecessary, distracting details so users have only one path to follow: in this case, to register for your event. Provide detailed information about the subject of your webinar, your guest or guests, what participants can learn, and how it will help them solve a problem. Include the date and time of your webinar, one or two relevant images, and a form through which users can register for the event. After users register, they should be directed to a confirmation/thank you page. Affirm that they have successfully saved a spot in your webinar and thank them for their participation. You should also send an automatic confirmation email that contains the details of the event as a reminder they can save for later reference. Bonus Tip: On your confirmation page, provide another input box and ask registered users if they have any questions they would like to see answered in the webinar. This allows your participants a way to interact even before the event begins, and also gives them an additional vested interest in attending. Plus, you’re adding registrant-confirmed valuable content that will help your webinar be even more on-point to meet participant needs. The average internet user spends 88% more time on a website with video. People love videos, so use that as an additional tool to communicate the facts about your webinar. You have already built a landing page for your webinar; include a one to two minute promotional video. Video on a landing page can increase conversions by 80% or more. Also, upload and optimize your video on YouTube, then share it on blogs, social media, and through any paid ads you plan to use. Write a promotional blog article dedicated specifically to promoting your webinar. Be sure to include all the essentials like time and location, speakers, and reasons why people should attend. Embed your promotional video near the top and allow users to share both the video itself and the blog on various social media platforms. Also, promote your blog post through social media and any paid advertising. Place your webinar as the foremost offer on your website and pair it with a related lead magnet. Webinar registrants receive something they can use that is related to your webinar topic as soon as they reach the confirmation page, or at least within five minutes of registration. A free download related to the webinar, such as a one-page “tops & tricks” document or other material from the webinar guests, is another enticement for registrants to actually attend. A Hello Bar appears across the top of a user’s screen with a special message, usually your current offer. Use it to briefly describe the webinar offer and provide a link for users to follow. Hello Bars are very successful in increasing leads for special events. The Exit-Intent Popup is a bit more intrusive than the Hello Bar, but is also proven to increase leads. Use this on your blog post or special advertising page for your webinar. The exit-intent pops up when a page visitor hovers their mouse outside of the website page, including a different browser tab or the X in their browser window. A window appears offering them another chance to read about your offer and click to learn more or register. Bonus Tip: Be sure to hide this feature from users who have already registered for your webinar to decrease message repetition and potential annoyance. Use this baseline strategy for an email workflow series to promote your webinar. This email should have similar content to the landing page, letting your recipients know you’re having a webinar, sharing the time, speakers, and location, and providing an easy way to register right from the email. Both emails should remind the recipient of the webinar, but also ask for some feedback on why they haven’t registered yet. Bonus Tip: Create a separate landing page to link in the email asking users to respond as to why they have not registered. Use the feedback to plan the parameters and topics for your next webinar. This email is just a brief reminder to those who have registered of the time and location of the webinar, and another brief thanks for registering. Registrants: Send all registrants the recording of your webinar. They should not have to fill out a form to access this since they already did this when they registered. Include some social share links, and ask them to share it with their co-workers, friends, or family who would also be interested. Bonus Tip: The share links should bring visitors to a landing page that gates the recording. Here you can gather names and emails for new leads! Non-Registrants: Send the people who didn’t register a chance to still view the recorded version. If they couldn’t make the webinar that day or never got around to registering, this gives them the option to watch it at their own leisure. Social media is the obvious place to advertise your webinar, through organic and paid options if possible. Some research here will reveal where your target audience hangs out the most, and this will allow you to target your advertising and better use your budget. Focus on brief posts that lead interested users to your blog and promotional video and/or directly to the landing page. There you have it; eight strategies you can use together to fill your webinar with interested participants. If you use these strategies, let us know how they worked for you. If you have other ways of promoting and filling your webinar, share them with us in the comments below.